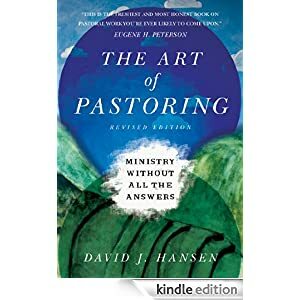 The Art of Pastoring (Revised Edition) by David Hansen. I have had the first edition of The Art of Pastoring on my shelf for several years and picked at it a couple of times, but never got into it for one reason or another. The revised edition allowed me a fresh look, and it is a look I have enjoyed. There are no firm answers in this book, and I have found in over 25 years of ministry that anyone claiming to have answers just hasn’t been in ministry long enough. Hansen sets the myth of “having all the answers” aside and just gives us real life stories. Most of his stories come from his rural pastorates in Montana, but I found the stories applicable in my own urban setting. The refreshing attraction to Hansen’s book is his incredible honesty. I found my story in this book. When he describes his calling to ministry, he said his first desire was to be a history teacher. That is so similar to my own calling it was uncanny. I had grown up planning on being a historian or a journalist. When I was called into ministry on a student missions trip my senior year in high school, I was completely thrown off. No one else was surprised, but I was totally shocked. It was, to me, the impossible. For those with a few years in ministry, this book is a great encouragement. For those going into ministry, this book is a MUST read. I teach in a college that has about half the students preparing for Christian ministry. They are fed dreams of megachurches. When I get any opportunity to pour into their lives in a practical level, I try to temper those dreams with the realities of living life in a much different way. It is a life that can be enjoyed. The Art of Pastoring (Revised Edition) by David Hansen was sent to me for review by InterVarsity Press. I am under no obligation to give it a positive review. Dan..I picked that book up a while back and soon made a decision that it is one of my favourite pastoral books. I’m glad you decided to pick it up and read it,…I felt that the book was reading me..and not me reading the book. Good observation. I certainly felt the same way.